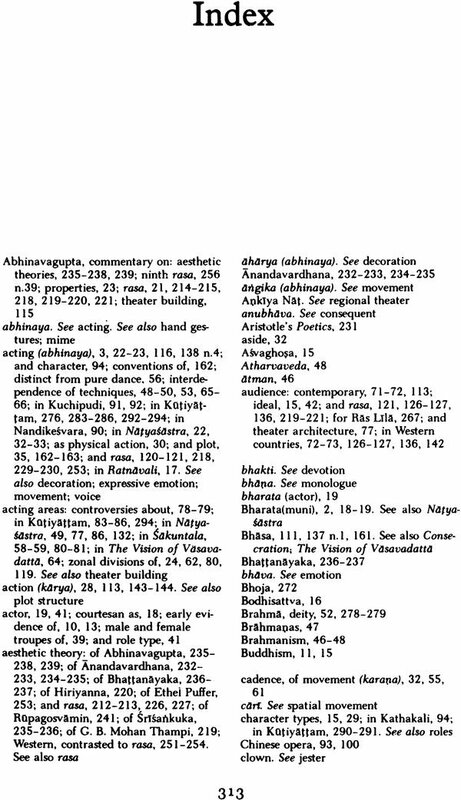 This book grew out of the First International Conference on the Art of Sanskrit Drama in Performance, held at the University of Hawaii in March 1974. 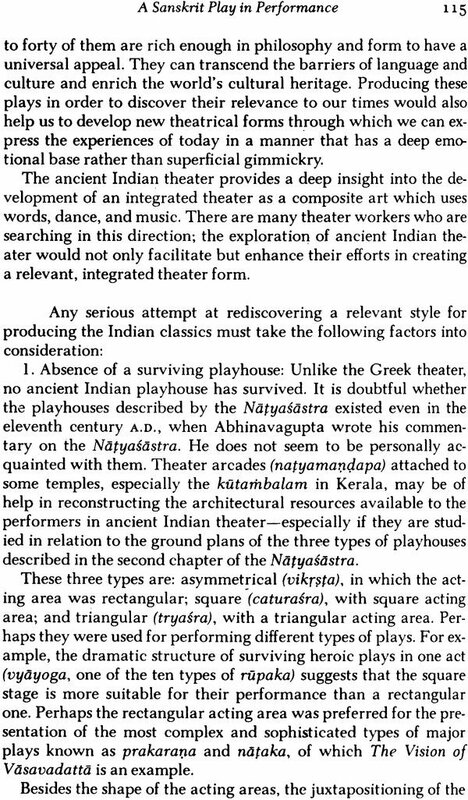 It is specifically concerned with the theatrical tradition of the Sanskrit theater-how the great classic dramas of ancient India were performed on the living stage. 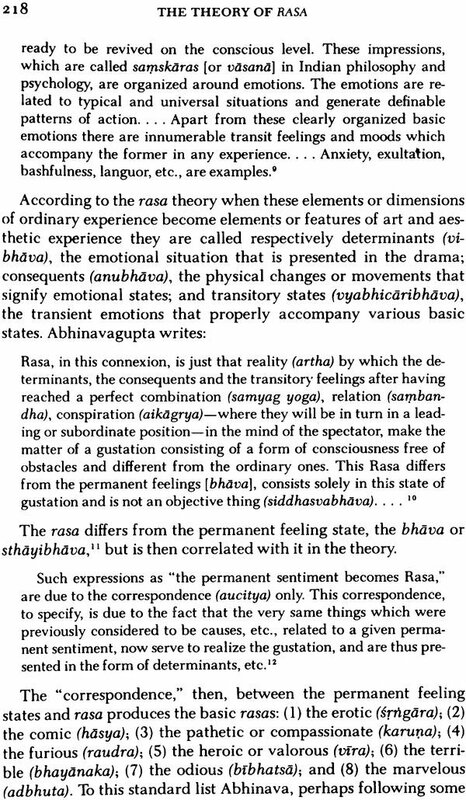 Although these poetic dramas are esteemed as the finest fruit of Sanskrit literature, they were written for the stage; and it is only in performance that the sublime aesthetic response of rasa can be experienced. 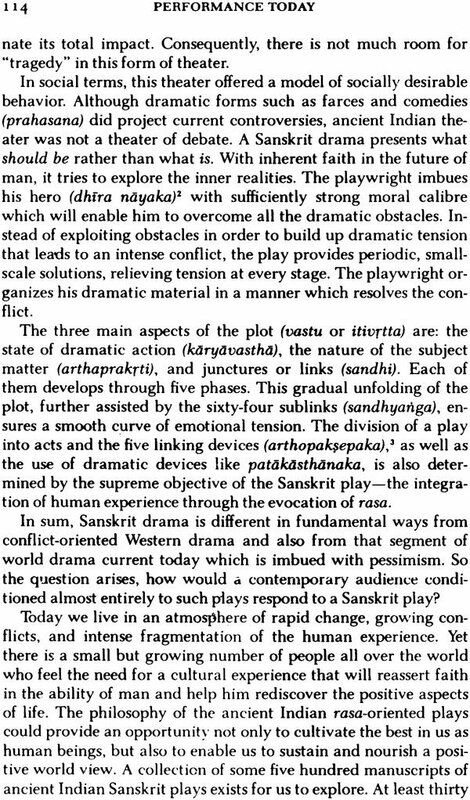 In scope, complexity of conception, and attention to detail, there probably has not been in the history of world theater a more developed 'system' for staging a play than that of Sanskrit drama. Leading Indian and Western scholars discuss the classical performance tradition not only from a scholarly perspective, but with a keen eye toward the reconstruction of acting, dance, and music techniques, largely lost in India during the medieval period. 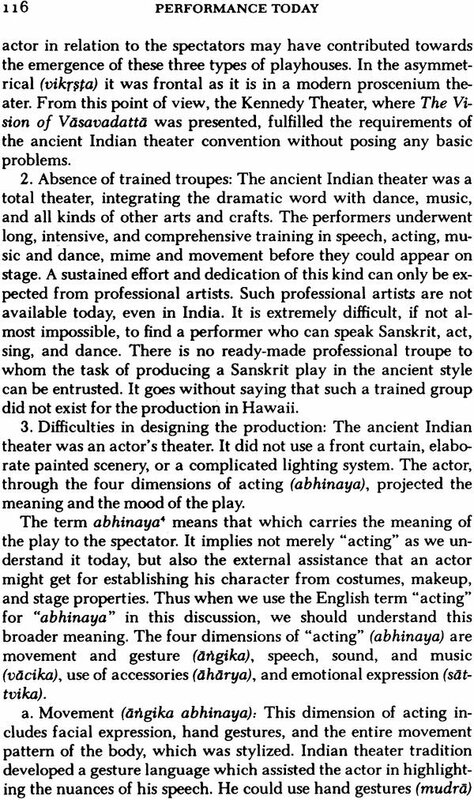 And the relevance of Sanskrit theater practices in the modem world is touched upon. Foremost among the questions under consideration are how Sanskrit plays were actually performed in ancient India and how Sanskrit plays can be staged today. 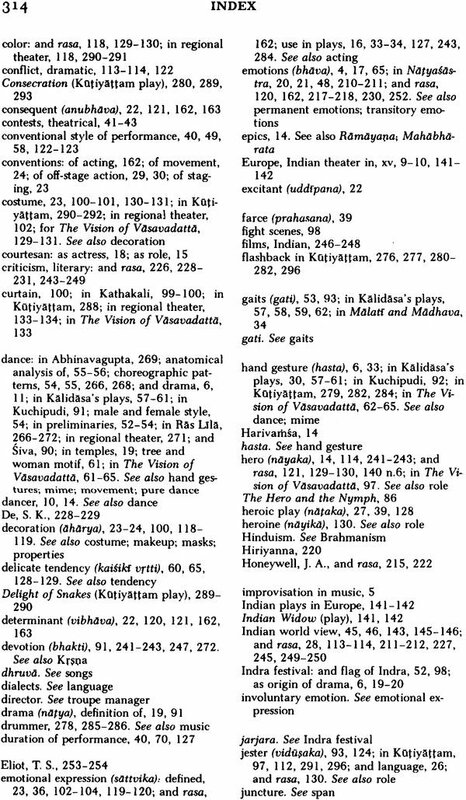 The authors examine five general sources: The Natyasastra, commentaries on the Natyasastra and other written references; selected dramas illustrative of performing traditions; the considerable visual evidence found in Indian temples; and the forms of regional theater that are living arts in India today. Rachel Van M. Baumer began work on this volume when she was chairman of the South Asia Studies Program at the University of Hawaii, where she taught Bengali language and literature. She is editor of Aspects of Bengali History and Society and author of many articles on Bengali literature and the influence of classical literary techniques and aesthetics on the modern literature of South Asia. James R. Brandon is professor of Asian theater at the University of Hawaii. He lived in Asia for eleven years, where he conducted research in the plays and performing traditions of most Asian countries. He is the recipient of fellowships from the Ford Foundation, the JDR 3rd Fund, Fulbright-Hays, the National Endowment for the Humanities, and the American Institute for Indian Studies. In 1977 he received the University of Hawaii Regent's Medal and Award for Distinguished Research for his work in Asian theater. He has edited or written a number of books. INDIA IS one of the great repositories of performing arts, particularly those of the classical, folk/ popular, devotional and modern traditions. The sheer enormity and diversity of its cultural expressions in music, dance, dance/drama and theatre are the envy of many nations around the world. This series intends to assemble some of the best books now available on these subjects. Without exaggeration, a series such as this would not have been possible twenty years ago when I first began writing about Indian theatre. 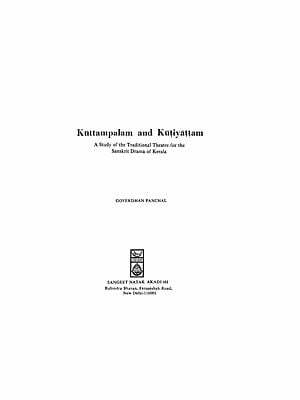 At that time little more than a few dozen books comprised the entire field of scholarship in the English language, not to mention the paucity of materials in regional Indian languages. Today that picture has radically changed. Numerous publishers have devoted precious press time to volumes of well-illustrated, detailed and, yes, sometimes even esoteric works on the multiple aspects of this fascinating subject. Comb any bookshop in Delhi or Madras, Bombay or Calcutta and you will regularly find new works appearing on the shelves. This represents a real area of growth! It is to the credit of Motilal Banarsidass that there is now the potential of assembling numerous volumes together under one umbrella. The essays in this edition, of which mine is happily one, focus on the problems and potentials of Sanskrit theatre and drama, in the modern world and in the past, in India and abroad. They emerge from a major international conference on the subject and are coloured by the unique perspective of the scholars, practising theatre artists and educators who actively participated in the debates. There is much food for thought and articulation if not resolution, of the conflicting perspectives that such a conference inevitably generates. IN THE SPRING OF 1972, a happy conjunction of circumstances made possible in Honolulu the planning of an unusual program of events concerned with the ancient drama and arts of India. A generous budget for the University of Hawaii's NDEA Language and Area Center for Asian Studies had just been announced for the following academic year by the Office of Education in Washington. A portion of these funds allotted to the South Asian Studies Committee of the Asian Studies Program provided a basis for discussion of various projects that might be supported in South Asian studies. James R. Brandon, a University of Hawaii scholar widely known for his work in Japanese and Indonesian theater, had just returned to Honolulu following a period in India spent in studying the various Indian theatrical traditions. Members of the South Asia Committee, aware of the great value and freshness of Professor Brandon's research, soon completed arrangements with him to chair a two-part program on Sanskrit drama at the university. The present volume contains material from that portion of the program sponsored directly by the South Asian Studies Committee with the cooperation of the Government of India's Ministry of Education, Under the auspices of the Asian Studies Program, and through the agency of James Brandon and myself, the committee organized and convened an international conference on Sanskrit drama in performance in the spring of 1974. 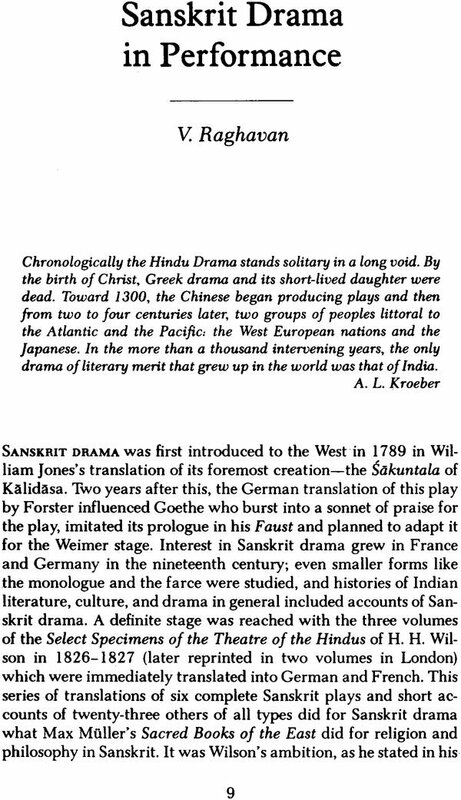 It was, as far as we know, the first time scholars had met together in the West to discuss this aspect of Sanskrit drama. Seminar papers were read by scholars from the United States, India, and Europe. Other papers, sent by those who could not attend the seminar, were placed before the final session for discussion. The process of choosing material among these many contributions to produce a manageable volume was difficult indeed, for the papers were of a high order of merit and a number of them were scholarly works of distinction. The main criterion employed in the selection process was the degree to which the papers dealt with the central theme of the seminar. Ten papers are presented here with an introduction and supplementary notes written by James Brandon. The supplementary notes contain new insights gained through discussion of the papers in the conference sessions. These notes and the papers on which they are based bring together both materials that otherwise would not be available in a single volume and new theories not published elsewhere. As with any conference and subsequent symposium volume, the organizers are aware of areas of the subject left untouched by the papers and discussion. The causes of deficiency are well known to all who have undertaken such projects. Financial restrictions limit the number of participants to be invited to the seminar. In addition, organizers often do not have access to complete information regarding research being done in the particular area under discussion. Even more often, extremely important aspects of a given subject are not being investigated at all. 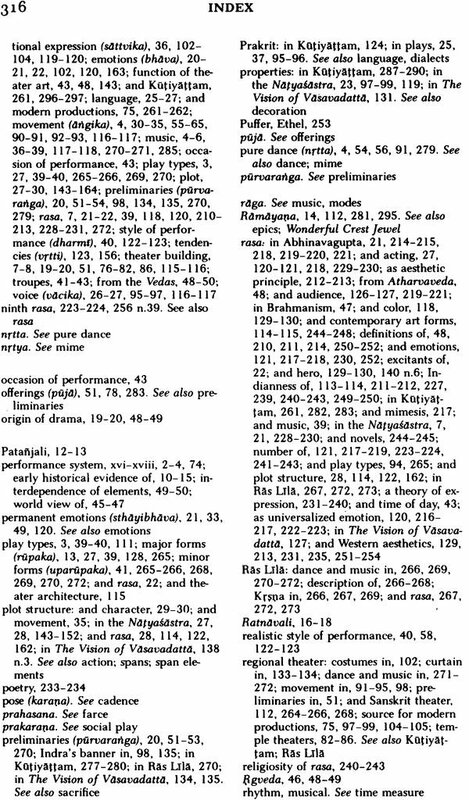 All of these factors play a part in the treatment of Sanskrit drama in performance in this volume. While confessing to certain shortcomings, we admit, at the same time, to a warming sense of pride in what we have accomplished. The symposium and this volume, which issues from it, are the beginnings of a new approach to the study of a much investigated subject. 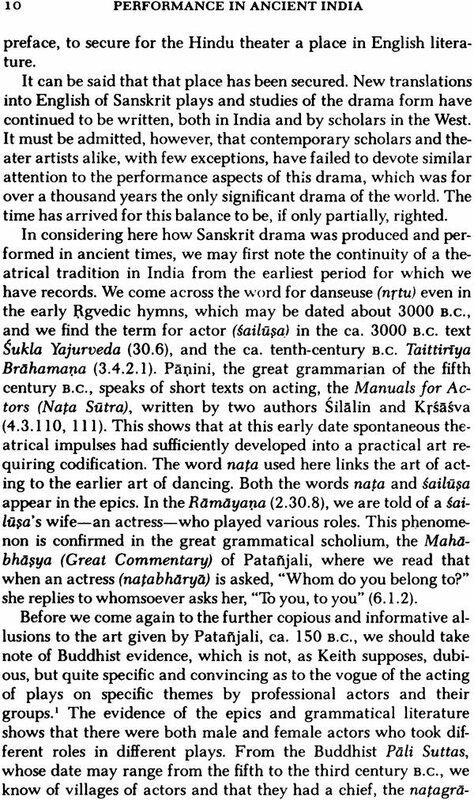 The classical drama of India has long been studied as literature; it is also read in the classroom as an aid to language learning, but, to our knowledge, it has not previously been the subject of scholarly investigation in the West from the point of view of living theater. For participants in the conference, the sense of Sanskrit drama as living theater was enhanced by the second part of the program. Bhasa's ancient and beautiful play, The Vision of Vasavadatta, was presented by the University of Hawaii Department of Drama and Theatre in cooperation with the Department of Music, the College of Continuing Education and Community Services, the Asian Studies Program, the East-West Center, and the (Hawaii) State Foundation on Culture and the Arts. In this production, under the direction of Shanta Gandhi, every effort was made to achieve an authentically Indian style of performance, utilizing, insofar as they could be known or imagined, the techniques of the classical stage. The play provided conference members with an intensely interesting laboratory experience, and it commanded the largest public response of the university's theater season. Further indications of strong public interest in the Indian arts were to be observed in two other events associated with the program on Sanskrit drama. (1) The College of Continuing Education and Community Services of the university, with the cooperation of the Department of Music and the State Foundation on Culture and the Art'), sponsored a well-received concert by M. Y. Kamashastri, director of music for All-India Radio and guest music director for the production of The Vision of Vasavdatta. (2) The Honolulu Academy of Arts presented an Indian mela, demonstrating traditional village arts of India. During the three-hour show, more than 2,500 people came to see the exhibits and demonstrations, all of which had been organized and presented under the efficient and imaginative supervision of Mrs. Gulab Watumull and Mrs. James Furstenburg of the Academy staff. For those of us who have experienced considerable intellectual stimulus from the study of Indian culture during the course of our careers, it was a delightful and somewhat heady experience to witness keen public enthusiasm for the live presentations of the classical and traditional arts of India. We could not have been so enriched, nor could we have made this present contribution to that all-absorbing study, had it not been for the splendid cooperation of a goodly number of people, some of whose names have already been mentioned. In the Asian Studies Program where the idea of such a program germinated, its director, D. W. Y. Kwok, provided invaluable help in the various administrative problems associated with such an undertaking. The manifold practical arrangements for the conference were made by the conference coordinator, Damaris A. Kirchhofer, whose cheerful and tireless labors are still remembered. Sanskrit words appearing throughout the text have been given uniformity of spelling in English through the unstinting, meticulous, and expert efforts of the university's professor of Sanskrit, Walter H. Maurer. Literally hundreds of hours were spent by Machiko Tsuruya and her assistants in the Asian Studies Program office in completing the clerical work connected with the conference and the present volume. Balwant Gargi, University of Punjab, generously assembled photographs of Sanskrit productions in India, of which only some could be reproduced here. Teviot B. Fairservis Pourchet assisted in compiling the index. 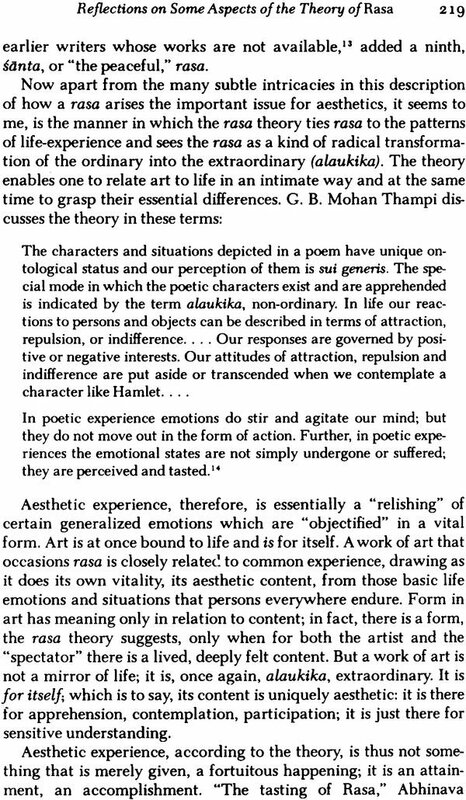 WE HOLD the theater of ancient India in high esteem primarily because of a score or so of full-length poetic dramas whose texts have somehow survived the vicissitudes of time down to the present day. Among the most widely known are Kalidasa's beautiful love story, Sakuntala, Sudraka's boisterous Little Clay Cart, and Bhasa's political romance, The Vision of Vasavadatta. 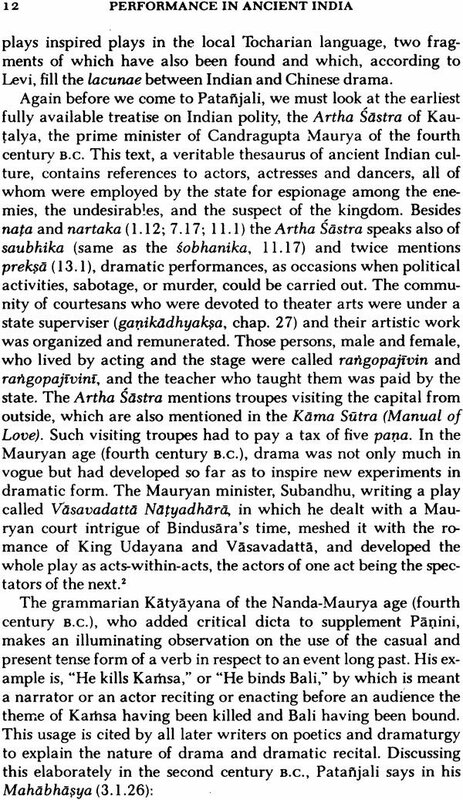 Somewhat less well known but much admired are Ratnavali, a harem intrigue by Harsa, the epic-derived The Latter Story of Rama by Bhavabhuti, and The Minister's Seal, a ruthless political play by Visakhadatta. 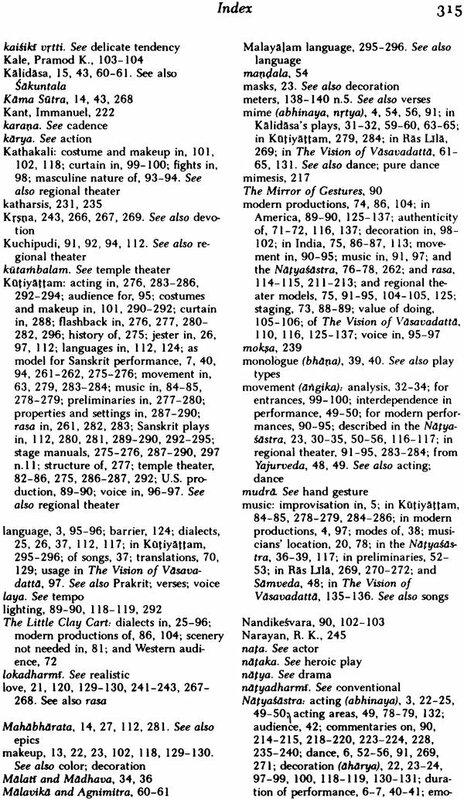 The earliest Sanskrit plays date from the first centuries of the Christian era (they are almost impossible to date accurately); the last important plays were written in the eighth and ninth centuries. Widely divergent though they are in subject matter, they all subscribe to a common dramatic theory and practice. For generations these superb dramas have merited diligent study by Indian scholars. 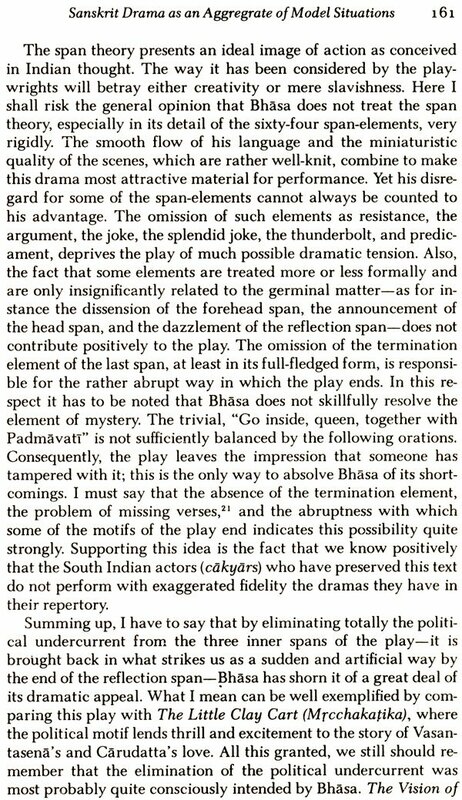 Indeed, the drama has always been considered the most suitable mode for poetic expression in India, and the ancient dramas are regarded as the finest fruit of Sanskrit literature. In the West, it will soon be two hundred years since Sakuntala, in English translation, burst upon a startled European intellectual world. Goethe, as we know, admired this gentle, sophisticated drama from the East and was influenced by it when writing Faust. The arduous task of playwriting was not undertaken as a mere poetic exercise by Kalidasa, Bhasa, Sudraka, and the other great playwrights. They intended their plays to be performed. And they were performed-by professional theater troupes patronized by royal courts and, very likely, in public theaters as well. When composing their dramas the authors knew, from practical experience, how they would be staged. They knew the musical system, acting style, and the physical theater. They worked, in short, within a living performing tradition which infused and helped to shape every aspect of their dramatic creativity. The performing tradition possessed its own dynamic, had its own rules, and was the product of its own creators (the actors, musicians, dancers, and craftsmen of the theater troupe). The traditions of performing could be stretched by a new play, but no play was conceived outside of them. As we look at the evidence before us, incomplete though it is, we see a performing system that is amazingly sophisticated and elaborate. Briefly, what is this system? The lines of a play are not merely "spoken" on stage. The dramatic text, which is written in alternating passages of prose and of verse in various meters, is chanted and sung (and perhaps in part spoken) and is enacted visually through formal schemes of dance movement, symbolic hand gestures, and codified facial expressions. With the support of costume and makeup patterns, actors and actresses represent specific types of characters in carefully determined situations which are appropriate to convey certain chosen emotional states. 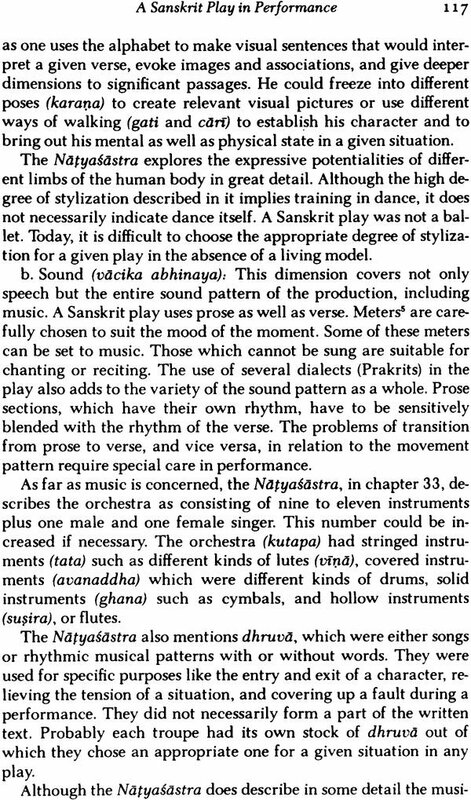 The whole is accompanied by instrumental music and interpolated songs (which do not necessarily appear in the author's play text). The proper procedures for constructing a theater, for carrying out preperformance ritual offerings, for warming up the audience with preliminary songs and dances, and for placing the different social groups within the auditorium are known and prescribed. 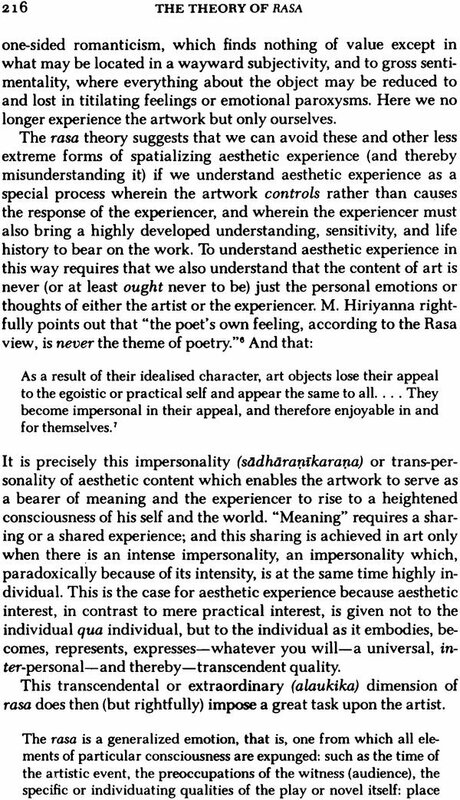 The aim of performance is to induce in the spectator a feeling of aesthetic delight (rasa), and each element of the production is judiciously chosen and arranged so that this highest aesthetic affect may be achieved through the performance. 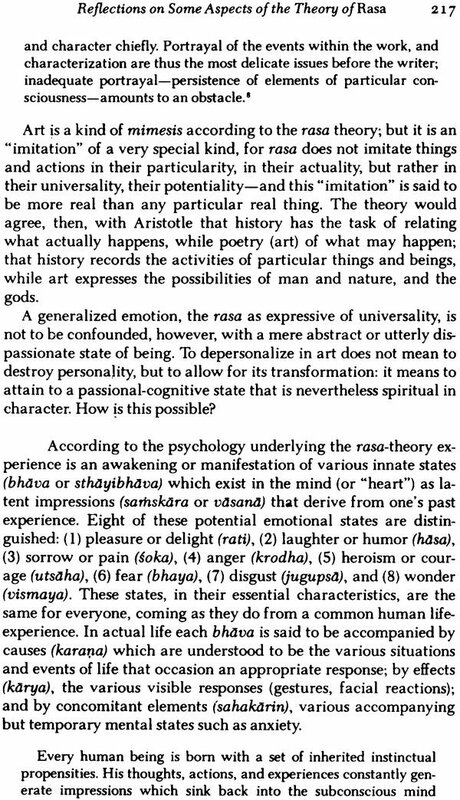 The performing tradition for Sanskrit plays maintained itself from perhaps several centuries before Christ until around the twelfth century-that is, for a period of twelve hundred to fifteen hundred years. In the fragile and ever-changing world of theater this is a very long time indeed: Javanese shadow theater goes back a thousand years or more; the No theater of Japan is entering its seventh century of continuous performance; the classical tradition of performing Greek tragedies lasted perhaps five hundred years; and the Elizabethan theatrical tradition, within which Shakespeare wrote, ended after a mere seventy-five years. 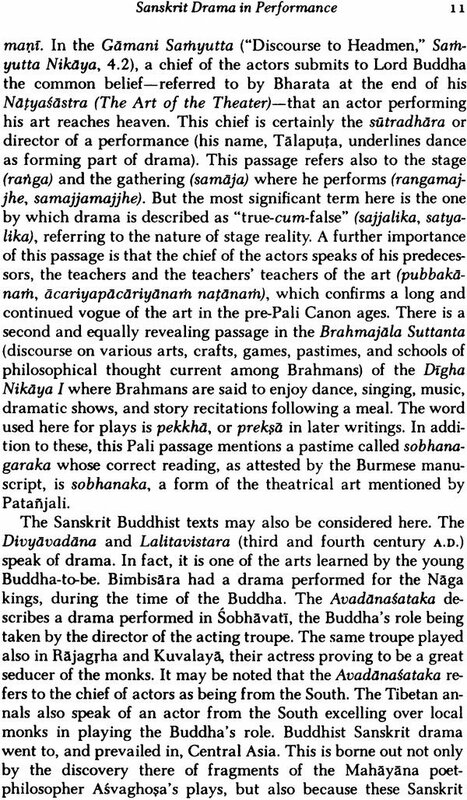 Certainly the fact that the performing conventions of the Sanskrit stage were highly codified and were committed to writing at an early date helped to stabilize and preserve the tradition. But even this long life eventually came to an end. The story is not an unusual one: a culture in decay, and a performing art, uprooted from its social context, gradually vanishing.